Jonah Hill’s come a long way from being just the overweight comic relief in Judd Apatow movies, hasn’t he? His turns in Superbad and Get Him to the Greek have since sky-rocketed him to stardom, hitting it big with the Jump Street movies and – perhaps most shocking of all – two Oscar nominations for his more dramatic work in Moneyball and The Wolf of Wall Street. 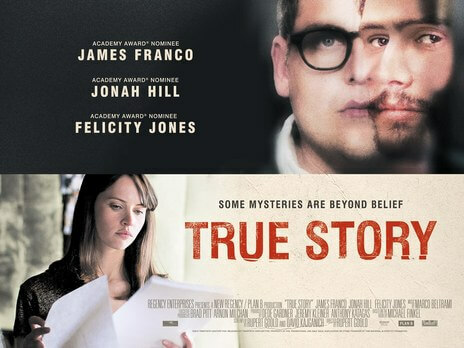 It’s the latter two that must have inspired Hill to reach for Oscar nom #3 with True Story, in which he reunites with fellow Apatow veteran James Franco in the very-not-funny tale of journalist Michael Finkel (Hill), sacked from the New York Times for fabricating elements of a cover story, learning of convict Christian Longo (Franco), awaiting trial for the murder of his family, who used Finkel’s name as a fugitive. Both Hill and Franco are very good in their respective roles – the trouble is, the film itself doesn’t reach their heights. As good as they are, both actors are not given especially compelling material to work off of. There is very little dramatic payoff or even any real stakes that puts either of them at risk – a good chunk of the film is both Finkel and Longo meeting in a contained interrogation room to explore Longo’s version of the crime he is accused of committing, for a book that Finkel is looking to write (it would indeed go on to become the titular bestseller that inspired this film), which although it makes for compelling acting doesn’t necessarily make for compelling viewing. These scenes can become repetitive, and as we learn more and more that Longo is not entirely willing to reveal everything they can also be rather irritating to us as the viewer. It may be close to what happened in the real meetings between Finkel and Longo, but when put in a dramatic context they can fall a little flat. Rupert Goold, a first-time director of a feature film (he previously directed a couple of Shakespeare adaptations for the BBC), isn’t able to inject much life into the story and the events surrounding it, making it all feel like a very long and particularly uninteresting episode of Law and Order. The crimes committed by Longo are certainly horrendous, but the film doesn’t dwell on it enough to make it the shocking revelation that it probably was in real life. Also – and we feel a bit bad for saying this, especially when it concerns real-life people – his crimes are nothing special, either; there are sadly hundreds of cases like this every year, so what makes Longo stand out from the crowd, the fact that he used a journalist’s name whilst in hiding? That’s not a particularly shocking twist, and it only seems to exist to give these two characters an excuse to see one another. Longo, as it transpires, just seems to be just another crazed murderer with an overwhelming case of narcissism, and more interesting films have been made out of similar convicts than this one, which never gives us a dramatic hook to keep our attention and only proceeds to drive us further away from the realms of caring about anyone involved. The biggest problem is that there are simply no stakes; if Longo is found not guilty and set free, so what? Well, Finkel wouldn’t have his book, but then there are many other real-life stories, not necessarily about crime, that can be typed up instead that would probably make for more interesting reading, anyway. Nobody is in danger of being killed, and it’s not as if Finkel’s reputation will be tarnished any further (after all, the New York Times blunder seems to be taking care of that), so why does this movie expect us to care all that much, least of all about the characters? Longo is a slimy creep for obvious reasons, and it’s established that Finkel is not very good at his job if he foregoes research and favours fabrication at one of the most prestigious publications in the world, while nobody else is given much room to flesh their own characters out (including the criminally underused Felicity Jones as Finkel’s wife). Nothing about them or the rest of the film stands out, and the result is a dull and convoluted homework assignment that fails to capture the interest of the audience and also paints an unflattering image of the real-life people it is supposedly meant to represent. The truest thing about True Story is the acting – at least they’re trying to look invested, more than we can say about the audience. True Story certainly boasts strong performances from Jonah Hill and James Franco, but even they cannot save this dull and unengaging courtroom drama with no dramatic stakes or artistic merit going for it.